Interstate 2 (I-2) is an east–west Interstate Highway running through the Lower Rio Grande Valley of South Texas. It begins at the intersection of U.S. Highway 83 (US 83) and Business U.S. Highway 83 (Bus. 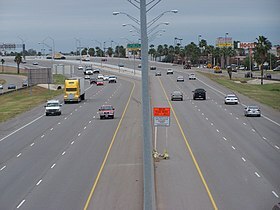 US 83) in Penitas and heads eastward before terminating at I-69E/ US 77/US 83 in Harlingen. For its entire length, I-2 runs concurrently with US 83. I-2 also parallels Mexican Federal Highway 2 (Fed. 2), another major east–west route that traces the Mexico-U.S. border along the Mexican side of the Rio Grande. I-2 begins at an at-grade intersection with US 83 and Bus. US 83 in Penitas. The Interstate heads eastward as a four-lane freeway through the Lower Rio Grande Valley. The route curves southeastward around Mission and McAllen to the south, running near McAllen International Airport. The route curves northeastward around Pharr, where it intersects with I-69C/ US 281 north of the city center. Continuing eastward, the route passes by many small cities, roughly paralleling Bus. US 83. The route ends at an interchange with I-69E/ US 77/US 83 in Harlingen. The exit numbers are set up to reflect the likely future western terminus of I-2, which would be in Laredo. ^ Essex, Allen (May 30, 2013). "State Adds I-69 to Interstate System". Brownsville Herald. Retrieved June 27, 2017. ^ Transportation Planning and Programming Division (n.d.). "Interstate Highway No. 2". Highway Designation Files. Texas Department of Transportation. Retrieved September 3, 2013. ^ Staff (May 31, 2013). "Interstate 69" (PDF). Texas Department of Transportation. Retrieved June 7, 2013. ^ Special Committee on U.S. Route Numbering (May 4, 2013). "Special Committee on US Route Numbering Report to SCOH on May 3, 2013 Meeting" (PDF) (Report). Washington, DC: American Association of State Highway and Transportation Officials. Archived from the original on October 16, 2017. Retrieved May 16, 2013. ^ Special Committee on U.S. Route Numbering (November 16, 2012). "SCOH Report from Special Committee on U.S. Route Numbering Annual Meeting" (PDF) (Report). Washington, DC: American Association of State Highway and Transportation Officials. Retrieved December 23, 2012. ^ a b Staff (May 30, 2013). "Interstate 69 Comes to Texarkana and the Valley" (Press release). Alliance for I-69 Texas. Retrieved May 31, 2013. ^ Nino, Mark (May 31, 2013). "Texas Transportation Commission Approves Interstate 69 System". Brownsville, TX: KVEO-TV. Archived from the original on October 19, 2013. Retrieved June 27, 2017. ^ Taylor, Steve (May 30, 2013). "Over 100 Miles of Valley Highways To Be Designated Interstate". Rio Grande Guardian. McAllen, TX. Retrieved June 1, 2013. ^ Janes, Jared (July 15, 2013). "Valley's I-69 signage the latest stop along superhighway dream". The Monitor. Retrieved July 17, 2013. ^ Staff (July 13, 2012). "Agency Gives US 77 Upgrades Final Environmental Clearance" (Press release). Alliance for I-69 Texas. Retrieved June 7, 2013. ^ Clark, Steve (August 8, 2011). "Interstate Link to Valley Moves Closer to Reality, Official Says". Brownsville Herald. Retrieved June 7, 2013.